1837 : Cuthbert FETHERSTONHAUGH, was b. 1837, Co Westmeath, Ireland son of Cuthbert FETHERSTONHAUGH and Susan CURTIS. 1843-48 : The family moved to Germany, but returned to Ireland in 1848 due to political disturbances in Germany. 1852 : Cuthbert's father, Cuthbert, Snr. and two older sons (Theobald & Alfred William) left Ireland for Victoria. 1853 : Cuthert, along with five male cousins sailed in the "Sussex" for Victoria. 1856-1862 : Cuthbert was employed in six years of "Colonial Experience" on Edward HENTY's "Muntham" Station with Tom HENTY, nephew of Edward HENTY as manager. Cuthbert's summary of this experience is mentioned below in a an extract from his memoirs, "After Many Days." 1856 : Cuthert's mother and sisters sailed to Victoria in the "James Baines" to join the rest of the family in a new life. 1863 : Cuthbert purchased the lease at "Burton Downs" north of Rockhampton, Queensland but struggled. 1866 : He sold his lease at "Burton Downs" Queensland and came to "Brookong" Station, in the Riverina area of New South Wales. 1873 : He was ordained an Anglican Priest at Wagga Wagga in July 1873. 1876 : Resigned from his position as an Anglican Priest and bebame manager of "Canally Station" Balranald, New South Wales. 1876 : Cuthbert FETHERSTONHAUGH was married in 1876 to Flora Agnes MURCHISON, b. 1840 Goulburn River, Port Phillip District of NSW, daughter of Capt. John MURCHISON, an ex-soldier who had arrived at Sydney in 1832, and Mary Ann ROBERTS of King Parrot Creek, Victoria. 1917 : Cuthbert published his early memoirs "After Many Days" in 1917. 1925 : Cuthbert died aged 88 at Wellington, NSW when returning to his residence "Mungerie" Station at Coonamble, NSW in 1925 and was buried at Blackheath, near Katoomba. 1931 : Cuthbert's widow Flora Agnes (nee MURCHISON) died at Chatswood, NSW in 1931 and was also buried at Blackheath, near Katoomba. 1950s : One of the new roads put through an area of the original "Muntham" Station, near Carapook, for a Soldier Settlement scheme was named FETHERSTONHAUGH Road. Maj. Cuthbert Murchison FETHERSTONHAUGH D.S.O. b. 1879, St Leonards, NSW, d. 1961, Chatswood, NSW., m1. 1912 Victoria Emma Shaw LYNE O.B.E. 1879-1939, m2. 1945 in Sydney, NSW to Lilian Doreen BIDENCOPE (nee CRISP), widow of Capt. C. V. BIDENCOPE. Cuthbert served in the Boer War with the 1st NSW Mounted Rifles. Served in WW1 with 12th Light Horse Regiment, AIF, promoted to Major in 1917. Awarded a DSO after the light horse charge at Beersheba, Palestine on 31 July 1917. Victoria Emma Shaw LYNE O.B.E. b. Albury, NSW to Sir William John LYNE & Martha Coates SHAW. Victoria served with the Red Cross for 4 years in WW1, awarded an OBE for her work in France, d. Sydney, NSW. Albany Murchison FETHERSTONHAUGH b. 1882, Sydney, NSW, d. 1966, NSW, m. (& div.) Agatha Mary McKENZIE 1885-1954, b. Victoria, d. NSW. Dorothea Murchison FETHERSTONHAUGH b. 1886, Sydney, NSW, d. 1974, m. James Archibald McMILLAN 1881-1934 b. Kerang, Vic., d. Katoomba, NSW. Cuthbert Fetherstonhaugh in his book "After Many Days" written in 1917 reminisced about his time at Muntham from 1856 - 1862 where he was undertaking his "colonial experience". Cuthbert, born in Ireland in 1837, was only 19 when he commenced his six-year association with the Muntham property has left a wealth of descriptive anecdotes about life at "Muntham" and the surrounding district with Tom HENTY. An extact follows..
My mother and sisters had been living at Portland since their arrival in Australia, and there they met Edward Henty and his nephew Tom, who was then manager of Muntham, and a slim good-looking young man. Tom offered to take me at Muntham to get a knowledge of cattle and cattle work while helping him in a general way-in other words to take me on as "colonial experiences," nowadays called Jackeroo. It was too good an offer to be refused, as I was to live with Tom Henty and would be within thirty miles of Hamilton, where the "Old Governor" was police magistrate, and where my mother and sisters and eldest brother were soon to join him. I parted with regret from my brumbies at Doogalook, and was very sorry indeed to say good-bye to my kind friends at Kerrisdale. It was ten years before I again met the latter. While camped at Kerrisdale, I was one night at Broadford, and I foregathered there with a man to whom my heart went out at once. He was a fine big fellow, a doctor, and wore glasses, and his name was Wyman. We became friends there and then, and sat up till almost grey dawn talking, and no doubt we had a few tumblers of "toddy," called, in my country, punch. Imagine how pleased I was on arriving at Muntham to find Dr. Wyman installed at Casterton as "medico" for the district. On my way to Muntham I spent a week at Portland with my dear ones. I found one sister engaged to a fellow passenger, Mons. Ponsard, already mentioned. and another sister, then only sixteen, engaged to a great friend of my boyhood in Kingstown, Albert Sitwell. When over in New Zealand in 1894 I was introduced to a very nice young fellow-a Mr. Sitwell. I said to him, "My favourite sister Fanny is married to a Sitwell. Can she by chance be related to you? "Why," he said, "she is my favourite aunt." Some months later on one sister was married in Portland, and she and her husband and my sister Fanny sailed for England. I rode down from Muntham to see the last of them, and I am not ashamed to say that I blubbered like a child when it came to good-bye. Portland was then a very jolly little town, lots of nice people and pretty girls, and Tom Henty and I thought nothing of riding down the seventy miles to a dance We had scores of good horses. I was greatly delighted with my new home and new home at Muntham. We had a big house to live in, very comfortable. As Edward Henty and Mrs. Henty came up now and then, the house had to be kept up, and we two young fellows had a couple in the kitchen and a housemaid to look after us. Then there was a five-acre garden full of beautiful fruit trees of every kind, with two gardeners in charge. The garden was catered by never-failing springs. Of two of these springs right beside each other one was quite salt, the other fresh. We had several stud horses. in fact four or five, and several grooms, so we felt ourselves to be quite important. The Muntham house must have been built in the early forties, and was very oddly placed on the side of a hill. To get to it from any direction but one, you had to climb a big steep hill, and then descend to the house, and from the other direction you had to come down a long hill, so steep that most people when being driven preferred to get out and walk. I have been overland from Melbourne to the Gulf of Carpentaria, and over most of Victoria, New South Wales, and Queensland, during a term of over half a century, and in all my travels I have not come across a property of similar area to compare with the rolling downs of the Old Muntham Estate. This magnificent property, with Casterton on the west, Sandford on the south, and Coleraine on the east, is situated at the junction of the Glenelg and Wannon Rivers, in the Far West of Victoria, some fifty miles from the border of South Australia. I write, of course, of the original run which, when I went there in 1856 to gain Colonial experience, comprised an area of 77,000 acres, and while still practically unimproved, depastured no less than 55,000 sheep, 8000 head of cattle, and 500 horses. That is to say, this piece of country in its natural unimproved state, carried equal to over a sheep and a half to the acre! The cattle and horses ran loose, but the sheep were shepherded. The country is of volcanic formation, rich black and chocolate soil going down to fabulous depths as disclosed by the "cutaways" which gradually formed after the country was stocked. The climate is almost perfect, and droughts are practically unknown. Ideal country! Well may Rolf Boldrewood write: "And is not the Wannon the pick of creation - Colac, perhaps, excepted ? " 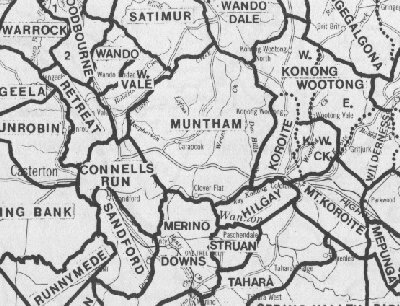 Muntham was taken up in the latter part of 1837 by Edward Henty, who, with his brother Frank, of Merino Downs (a beautiful property on the opposite side of the Wannon to Muntham) were the pioneers of the Ear West of Victoria. The Henty brothers brought sheep out to Tasmania from England in 1830. baring first tried West Australia, and they were followed shortly afterwards by their father, Thomas Henty (a noted breeder of sheep, cattle, and horses In Sussex). In 1834 two of the brothers, Edward and Frank, came over to Portland Bay in connection with a whaling venture. They settled there, and got over some horses, cattle and sheep. Two years after-wards they were followed by another brother, Stephen George Henty, who also settled in Portland Bay, and who, for many years, was the leading merchant of Portland-a man whose word was his bond, and whose beautiful home was always open to a host of friends. He afterwards went to Melbourne, and resided there for many years. His widow, beloved and respected by all who had the privilege of knowing her, lived at Hamilton with her daughter, Mrs. Stapyleton Bree, up to the time of her death. Their son, Richmond, was born the year Muntham and Merino Downs were taken up. One daughter, Emily, married my great friend, Dr. T. M. Wyley, a fine, handsome fellow. He succeeded Dr. Wyman at Casterton. He went through the Crimean War, an army surgeon In the same regiment with Major Pennycuick, who married a daughter of William Rutledge, of Port Fairy. Mrs. Wyley died at Hamilton within a year of her marriage, and poor Wyley only survived her a year or two. James Henty, another brother, came to Port Phillip later on, and was successful in Melbourne in business m a large way. There was another brother, John, and still another brother, William, who went into politics, and was for some years Chief Secretary of Tasmania. I knew only the three pioneers, Edward, Frank and Stephen. Rolf Boldrewood writes of the Hentys as those representative Englishmen and distinguished colonists who commenced the Anglo-Saxon conquest of Australia Felix. Stalwart and steadfast were they, well fitted to contend with the rude forces of nature and still ruder individuals, among which their lot was chiefly east in those days. But withal genial, hilarious, and in their moments of relaxation prone to indulge in the full swing of those animal spirits which for the most part accompany a robust, bodily and mental organisation." In 1836, while still at Portland Bay, the Hentys were greatly surprised by Major Mitchell, the brave and capable explorer, tumbling right in on them quite unexpectedly from the north. The Major was equally surprised to find Portland Bay in the occupation of whites, and at first thought they must be escaped bushrangers. Even in my time in more than one place I have seen the Major's track, being the indent made in the soft virgin soil by the wheels of his bullock dray. The Major reported that he had passed through magnificent pastoral country, well watered, about fifty miles to the north, and as the country about Portland was not good sheep country, a good deal of it being sand covered with heath, while the forest land was so thickly timbered as to preclude the growth of grass, the brothers determined, like the patriarchs of old, to trek for the promised land, with their sheep, cattle and horses. Having satisfied themselves of the magnificent character of the country described by Major Mitchell, Edward and Frank Henty, whose sheep, brought over from Tasmania to Portland Bay, had by this time considerably increased, decided to make for these pastures new, and in the latter part of 1847 Merino Downs and Muntham were taken up. Winter told me that when the diggings broke-out in 1851, and labour was not to be had, he put all his sheep into two flocks, and two magnificent St. Bernard dogs used to take the sheep out all day and look after them and keep them apart, and then at night these grand dogs used to sleep between the two flocks and guard them. Winter was a most delightful main to meet, intellectual, kind, and generous. He, like Acheson :Ffrench, very early adopted the Darwinian teaching, and consequently both were looked upon with great suspicion by the orthodox; indeed, as already stated, Ffrench was designated an atheist because he professed belief in what the majority of educated clergymen now teach from their pulpits (:rood Parson Russell, whose parsonage was not far from Murndal, and built on land presented by Sam Winter, must have had many a discussion with the latter on this and other interesting subjects. They were fast friends. Dr. Russell was not only clever and intellectual, but one of the best men I ever knew. Frank Henty lived at Merino Downs for many years, and brought up a family of three girls, and one Joy; the latter died young, but two of the "girls" still survive. Kinder or more considerate host and hostess than Mr. and Mrs. Frank were not to be met with m those dear old days, when there was no ceremony, and but little conventionality, and when a visitor could always be sure of a hearty welcome, and the only difficulty was to get away again. At the time the Henty's put stock on the rich Wannon country (1837), there was but little settlement elsewhere in Port Phillip, as Victoria was then called. In the December of the previous year (1836) Hepburn and party had arrived at Hobson's Bay overland from Sydney, and they found, as Hepburn says in a letter to Governor Latrobe, "only a few huts in the settlement; one was that occupied by Batman, one by Dr. Thomson, one little wooden box was occupied by Strachan, and stood where the Western Market now stands. The Old Iamb Inn was being built, but no accommodation of any sort was to be had for love or money. Buckley was the first man I saw." Yet four years before this Frank Jenkins (who died in 1903) was actually settled at Buckingbong, on the Murrumbidgee River, near the present town of Narandera, but on the opposite side of the river. Frank was only twelve years old then, and a hot time he and his mates must have had with the blacks in the thick country among the anabranches of the Murrumbidgee. Frank Jenkins used to talkie cheeses and hams and bacon from 13uckingbong to Sydney in the old days in a bullock dray. Just imagine starting off in these early days over what was scarcely a bush track some 400 miles with a load of farm produce for Sydney. Plenty of grit that. By 1838 a good many Sydney men had pushed through to Port Phillip, among them as already mentioned my father-in-law, Captain Murchison, who was preceded by his son-in-law, Farquhar Mackenzie. The history of the Muntham flock is a sad one. The Hentys were most successful breeders of Merino sheep in England. In fact, like Sir Samuel McCaughey, at one time in New South Wales, they "swept the board" at the sheep shows in England, so much so, that after a while no one would show against them, and their sheep had to be sent in as non-competitive, and merely for exhibition. In 1830 the Henty brothers took a number of these sheep to Tasmania, and their father, Thomas Henty, followed with another importation. The flock was kept intact without any mixture of other blood, and to the day of his death Mr. Henty never sold a ewe. At his death the whole flock was taken over to Port Phillip by his sons Frank and Edward. The latter, following his father's lead, never sold a ewe (at any rate up to the time I left Muntham in 1862). Muntham is too rich country for the successful pro-duction of Merino sheep. The Muntham flock was never classed or culled; it was full of scab, and footrot was very prevalent. There could only be one result. Moreover, the sheep had been inbred for years and years, and breeders knew well how prepotent are inbred stock. An inbred flock, herd, or stud requires more than careful management on account of this "prepotency," for necessarily not only will the rood qualities be reproduced but it would also appear as if defects were even still more pronounced in the progeny. . The cost of running Muntham must have been very great. I'll just count it up. A sheep manager, cattle manager, two sheep overseers and their families, lead stockman, two stockmen, twenty shepherds, twelve hutkeepers, two grooms, too gardeners, a mar-ried couple, housemaid, four labourers. Then the cost of shearing, sheep-mustering, dipping for scab, footrotting. I am that the sheep that. the sheep were carried on at a loss. But then there was not any. It will hardly be credited when I state that during the six years I was at Muntham, while not over 6000 sheep were sold, yet the flock did not increase in numbers. There were 55,000 sheep in 1856, and there were no more in 1862, and yet I am positive there were not 6000 wethers sold during the six years, and no ewes were ever sold. The decrease from disease and old age practically balanced the increase! I should have mentioned that it was only in the spring and early summer that there were any fat sheep, and as everyone had fat sheep at that time of year, fats were at their lowest, and Mr. Henty would not accept the prices going. By the time prices recovered his wethers had fallen off, and were not mar-ketable, and this went on year after year. The flock deteriorated so terribly that when Joe Pearson (another old mate of mine "over the sticks" -as true as steel and as plucky as you make them) bought the sheep in 1879, he could not find one ewe or one ram fit to breed from. The results attained in Tasmania by the good breeders there from similar sheep to those brought over by Mr. Henty in 1830 shows what might have been done with this one-time high-class and valuable flock. Edward Henty imported some Cotswold ewes and rams from England while I was at Muntham. They did well, and were very prolific. I have often seen ewes with three lambs following them. In 1856 a Mr. McKenzie managed the sheep at Muntham; he came from Wyuna, on the Goulburn. Tom Henty, son of James Henty, of Melbourne, and nephew of Edward, had charge of the cattle and horses. McKenzie did not care about the dual management, and left, and was succeeded by a young Scotchman, Robert George Macpherson, who had had some experience with Mr. Rutherford on the Murray. MacPherson was a fine fellow, and very good-looking. Tom was a bit too independent for Uncle Edward, and elected to leave and go on his own, and then I, to my delight, in 1859, got charge of the cattle and horses, and "Old Mae" and I worked together without the semblance of a hitch till he, too, left to go on his own at Fernihurst with Allfrey. He was succeeded by Charles Macarthur King, son of Admiral King. Shortly after King's advent, I, too, went on my own, and "trekked" to the far north of Queensland in 1862. (Charles Macarthur King was for many years in charge of Muntham, and afterwards was police magistrate at Bourke. He was always a favourite, and died about 1903 from blood poisoning. Tom Henty went either to Walla Walla or Round Hill, in New South Wales, and from there moved to Pakenham Park, Westernport (formerly the property of that fine old colonist and breeder, Dr. Bathe), and became a member of the Upper House in Victoria. Fortunately for Mr. Edward Henty's pocket and the pockets of his heirs, he did not pursue with his cattle the suicidal course followed with the sheep. The cattle on Muntham in 1856 consisted of a beautiful herd of well-bred Shorthorns, or Durhams, as we used to term them-soft, well-grown, and easily fattened, and for the most part roans. The bullocks were allowed to get age on them before being mar-keted; the spaying knife kept the herd well up to the mark, and up to the time I left there were few herds in Victoria to compare with that of Muntham. But even in my time deterioration must have commenced, as " ballys " ( Herefords) were introduced, and although the first cross left little to be desired, yet cattle form no exception to the rule in crossing, Liz., the first cross may be excellent, but to continue ends for the most part in disaster. I shall never forget the magnificent drafts of fat bullocks sent off "old Muntham, " generally two hundred head at a time of even bullocks, the fat packed on them, beautiful colours, and such well-bred 'uns. I remember one mob in particular, sold to an Adelaide buyer at £10 a head-on the yard post, as the phrase was-and guaranteed to average a thousand weight-a nice little lot to have had at Homebush or Flemington in 1915, when prime bullocks were making £40 and over. We sent one bullock to Melbourne; he walked down, and he went 15601bs. without his inside fat, and that went 1301bs. He fetched £40, and was, I heard, as tough as old boots, and no wonder, for he was ten years old. We tried many a time to get him away, without success; he always charged shortly after we left the yards, and would not be stopped. The fact was he was too fat, and if he had not fallen off a good deal we would never have got him away. He was a perfect animal, and ought to have been kept for a sire. I took a fine mob of )Muntham bullocks to Errata when the diggings first broke out there, but only got £8 per head for them. At Muntham the cattle were always yarded for branding calves and for fats, and so forth; it would have been much easier on the cattle to have cut them out on camp, as was, and is, the practice in the present colony, but "Teddy" was very conservative, and the old groove had to be run in. At odd times,, and when only a few cattle were required, we used to "cut them out " on the quiet, and, like Brer Fox, " lie low. " Jackson, the head stockman, had graduated in New South Wales, and he and I would have loved to have broken the cattle in properly to camp, and have had some good camp work for ourselves and our horses. We used to bring the cattle in five or six miles from the Den Hills and other parts, then take them into a paddock below the homestead and right past the stockyards, about a quarter of a mile up a steep hill, then through into another paddock, and then back again for the yards; by this time, as they were headed for There they had come from, they used to yard all right. But what a knocking about the cattle got, which might all have been saved! Inter on we erected yards on top of the hill, back to the homestead, and this saved a great deal of knocking about. I had some close shaves myself at Muntham. A bullock pinned me against the yard fence one day with a horn on each side of me, and no damage done, and one day an old "skiverer" of a cow charged too quickly for my horse out of a mob and sent a horn each side of my leg and into my horse; one horn pierced his heart, and he fell dead in a few yards. Another day my stock pony Pannikin stopped an old cow beautifully; she had broken, and I was trying to get her back to the mob when she charged us so sharply that I thought Pannikin must be gored. But in a second he landed home on the cow with both hind feet, and she was so astonished she turned and joined her mob. Through not camping the cattle and "culling out" those we wanted, I did not have such good cattle ex-perience there as I ought to have had. It is lovely to work a well-broken-in herd of cattle with good men and good horses, and splendid to watch the work. You walk your horse into the mob quietly and pick your beast, and work him quietly to the edge of the mob; most times, if a fat beast, he will go out quite quietly if not hustled and join those already "drafted," but with other classes you have often to go for all you are worth, and it is beautiful to see an old stock-horse at the game. 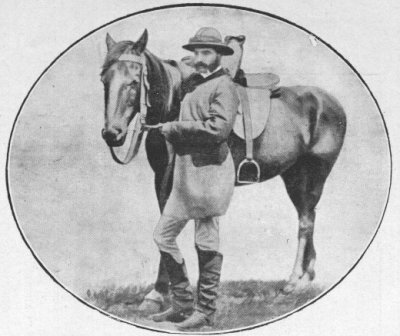 George Green (Iandra), when on the Upper Murray, had an old horse, such an adept at "drafting" that he often (to show what the old horse could do) would take the bridle off, and the old fellow would cut out all an afternoon "on his own." I still have happy reminiscences of the old days when the number of cracks of a stockwhip was the signal for a hut-keeper as we were approaching to know not only that we were "handy," but the number of mouths to expect.